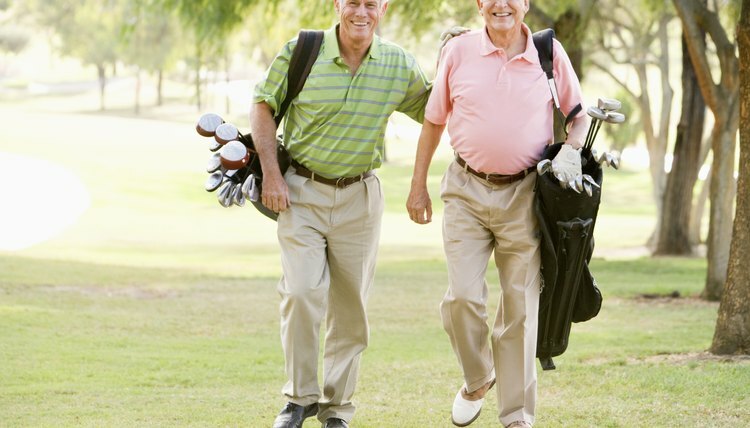 Golfing is an effective way for seniors to keep active. Many senior citizens across North America choose golf as a way to stay in shape. Although the sport is not particularly arduous, it provides seniors with ample cardiovascular exercise and stretches most parts of the body. Before a senior picks up his clubs and begins a round of golf, he should take time to loosen his body through a series of simple exercises. Walking for several hours puts strain on your lower body, and if your legs aren't loose, your game of golf can quickly become painful. Seniors don't need to perform drastic stretches to warm up their bodies. To exercise your ankles through the windshield wiper exercise, sit on a chair or bench so that your feet touch the ground. Slowly rotate both feet to the left, hold the pose, bring them back to center and then rotate them to the left as though your feet are windshield wipers. This stretch loosens the muscles and ligaments around the ankles. It's common for a golfer's quadriceps to cramp up if they're not stretched adequately. Fortunately, the stretch to loosen them is simple. Stand with both feet on the ground and steady yourself by holding onto a tree, door frame or even by using a golf club as a cane. Bend your left leg and the knee and hold your left foot as closely to your buttocks as possible with your left hand. You should feel a stretch in your quad. Hold this pose for 15 seconds, and then repeat it with the other leg. Find a suitable spot on the floor to lie on your back and plant your feet on the floor so your knees are in the air. Your feet should be slightly more than shoulder-width apart. Keep your torso planted on the floor and bend at the waste, dropping both knees to the left side. Hold this pose for 15 seconds, return to neutral and then repeat this exercise to the right side. Position a driver across your shoulders, just behind your neck. Grip each end of the driver with one hand and turn at the waist to the left. Only move as far as is comfortable. Hold the position for 15 seconds and then turn to the right. This exercise loosens your back muscles, which you can easily pull during a golf swing. Lightly swinging a golf club before playing your round is an effective way to loosen the muscles throughout your entire body and ensure you've warmed up every major muscle group. Don't necessarily worry about form; just swing the club back and forth until your arms, back and neck feel comfortable and loose.